As 2012 draws to a close, here's my top 5 Bollywood brides of the year! One of the more low-key bollywood weddings of the year, in December this year, Vidya went for a very traditional Tamil bridal style on her big day and many were disappointed when they saw the pics (myself included!). I was holding out hope that she would have some amazing glamourous wedding reception outfit, but that didn't happen. 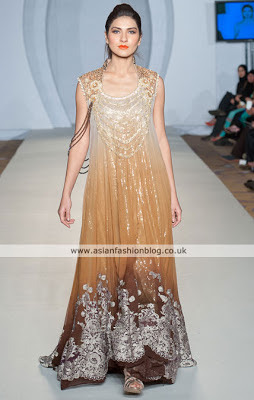 Here's her mehndi outfit by Sabyasachi. 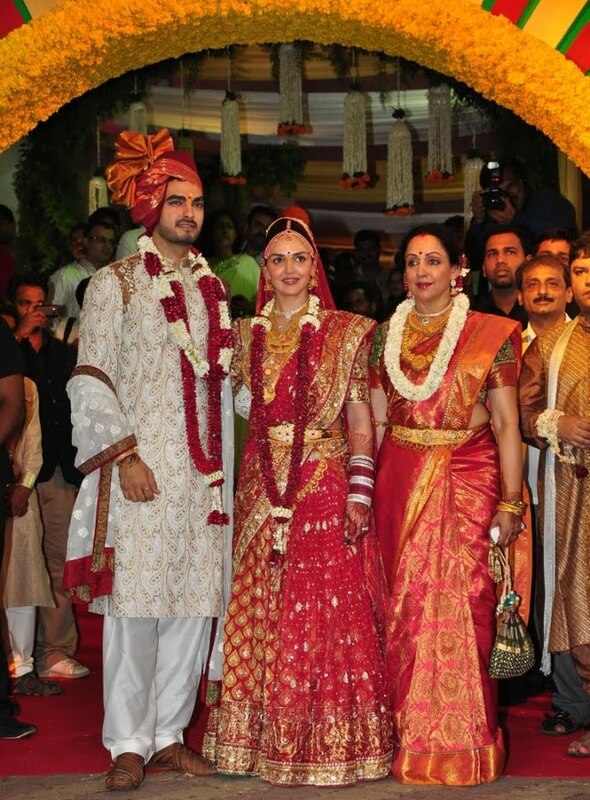 Esha Deol's wedding took place at the end of June and her outfits did not disappoint. 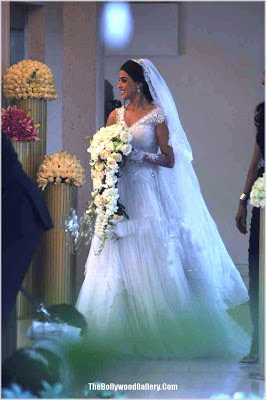 She opted for a traditional look for the wedding ceremony itself, but still managed to look glamourous. 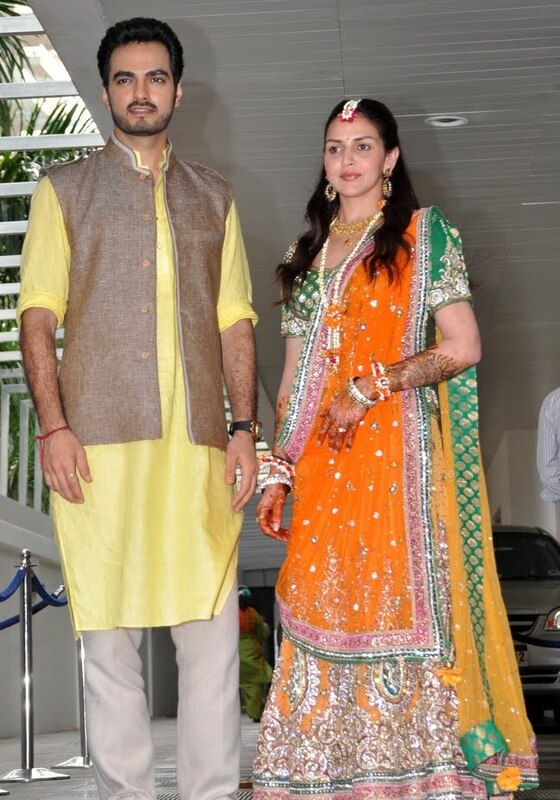 This outfit was designed by Neeta Lulla, as was her mehndi outfit below, which is my favourite out of her four wedding events! 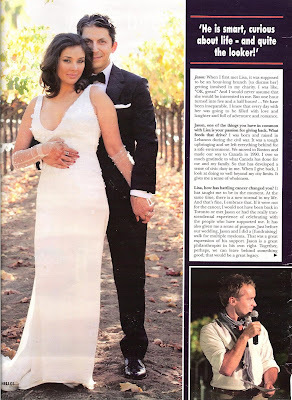 Lisa Ray probably doesn't qualify as a "Bollywood actress" to most people, but I just had to include her in my top 5 because there were a lot of Indian elements to her wedding - best of all the Satya Paul sari she wore for her reception. The event took place in October this year and she also wore a white wedding dress designed by Wendell Rodricks, and a sangeet outfit by Tarun Tahiliani. 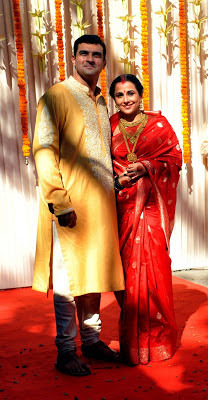 This wedding took place at the start of February just before the release of the couple's film "Tere Naal Love Ho Gaya". Neeta Lulla was the designer of the traditional bridal outfit above. 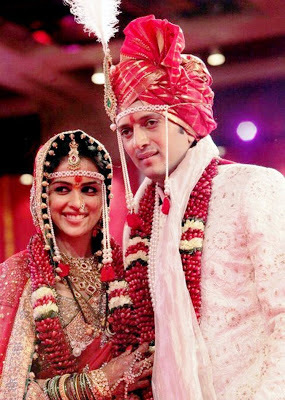 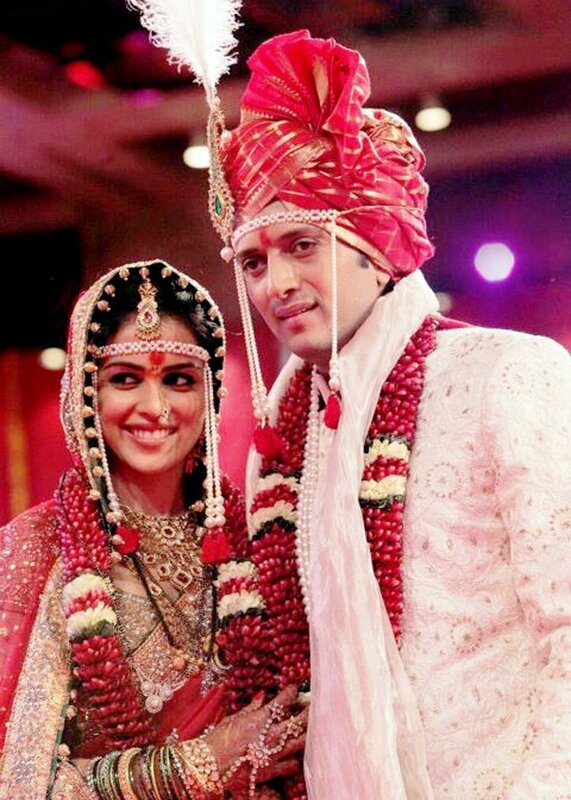 The couple also had a church wedding, where Genelia's dress was designed by Shantanu and Nikhil. 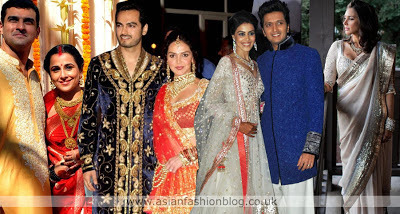 Perhaps the most high profile Bollywood wedding of 2012, this had to be my number one! 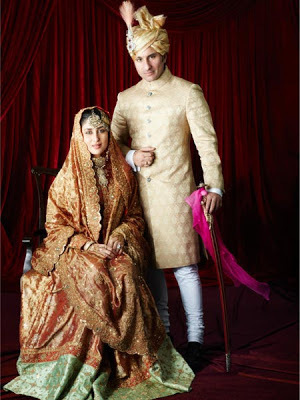 4 out of Kareena's 5 outfits were designed by Manish Malhotra, with the exception being the main wedding outfit above which is an antique lehnga worn by Kareena's new mother-in-law Sharmila Tagore on her wedding in 1969, and restored by Ritu Kumar for this occassion. 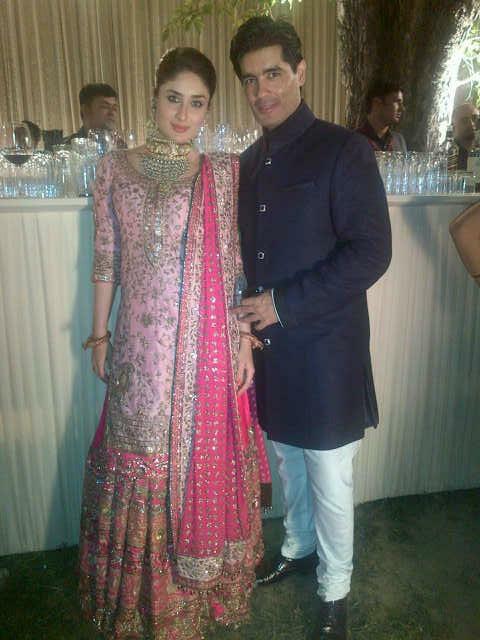 Here are all the Manish Malhotra outfits! So, that's 5 Bollywood brides and 18 different outfits! Which outfits did you love and which did you hate? Following on from my first look at Pakistan Fashion Week 3 in London, here's a more detailed look at the collection on the catwalk from Gul Ahmed. The collection was characterised by damask and zig-zag patterns, both of which are featured in this first striking black and gold outfit. 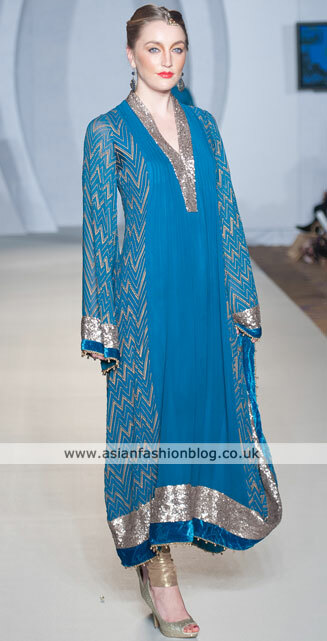 I like both patterns but the model seems to be a bit lost in all that fabric! 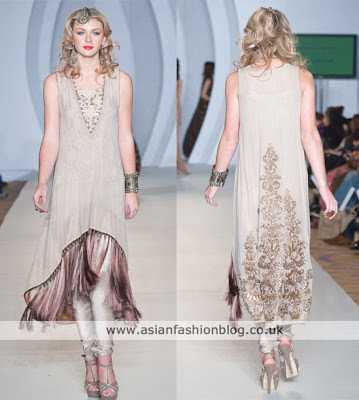 Fringing was another feature in some of these outfits, I'm not sure I like the way it looks, especially in the outfit below...but I think the embroidery design on the back makes up for my dislike of the fringing on the front! This next outfit was probably my least favourite from the collection, the fringing and neckline design don't appeal to me at all. 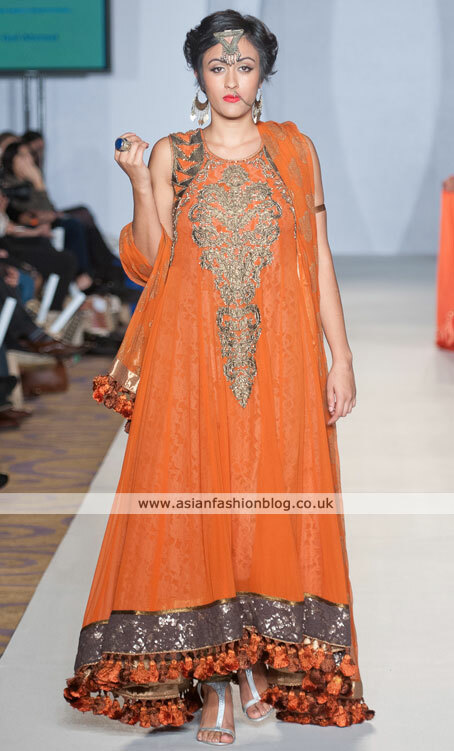 I really liked this next rust/orange outfit. 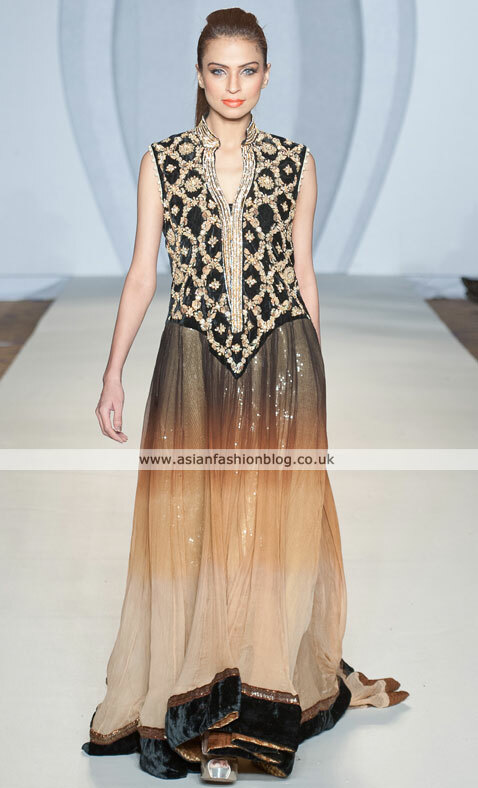 I love the sparkly border and the shorter fringing on this outfit is a lot more appealing. The style of this outfit isn't something I'd pick out for myself, but I love the colour combination and the subtle way blue has been added through the lining of the jacket. 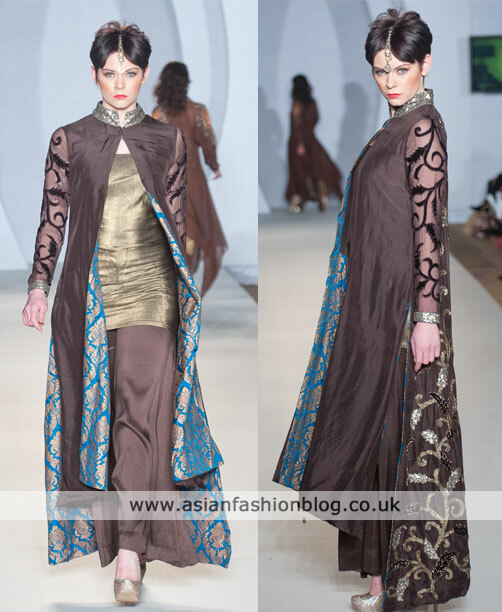 This was the finale outfit, another black and gold number with lots of layers. 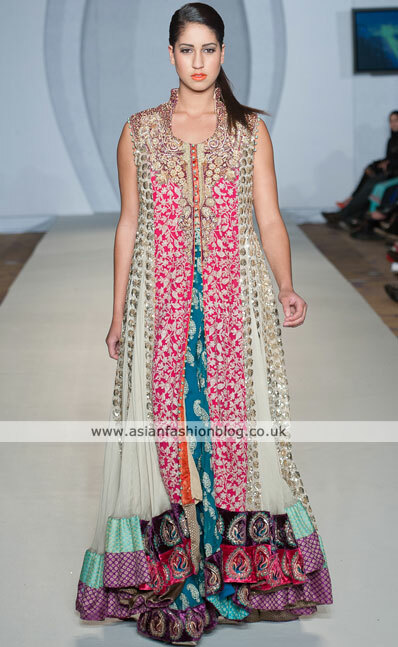 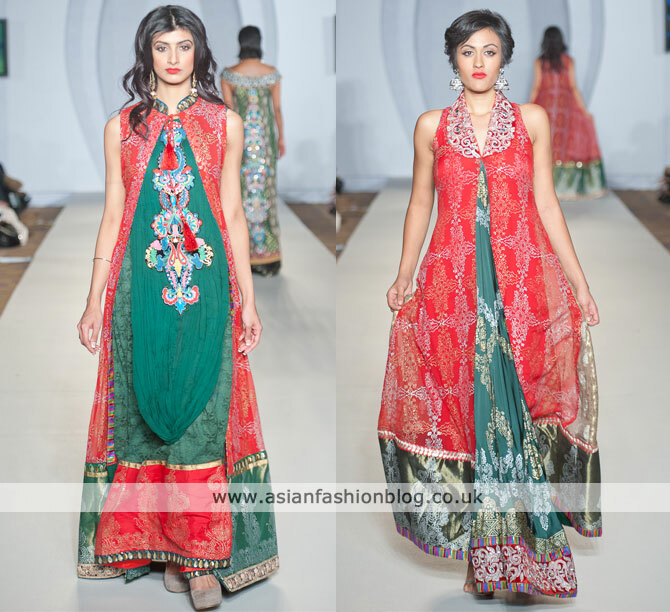 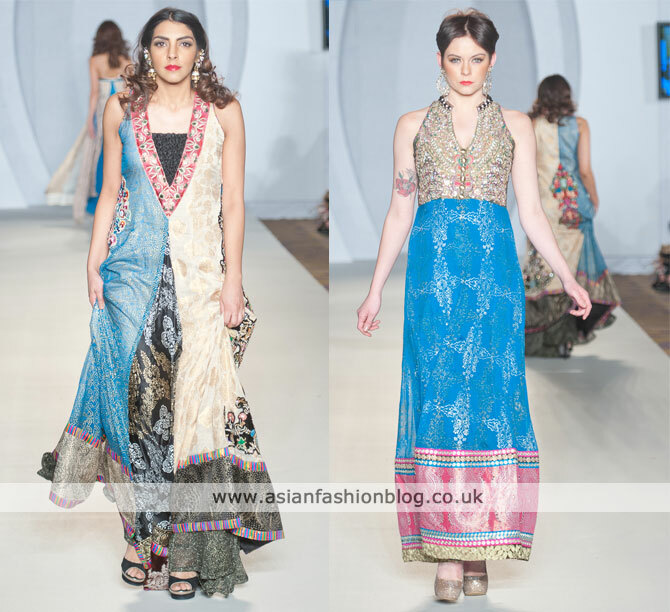 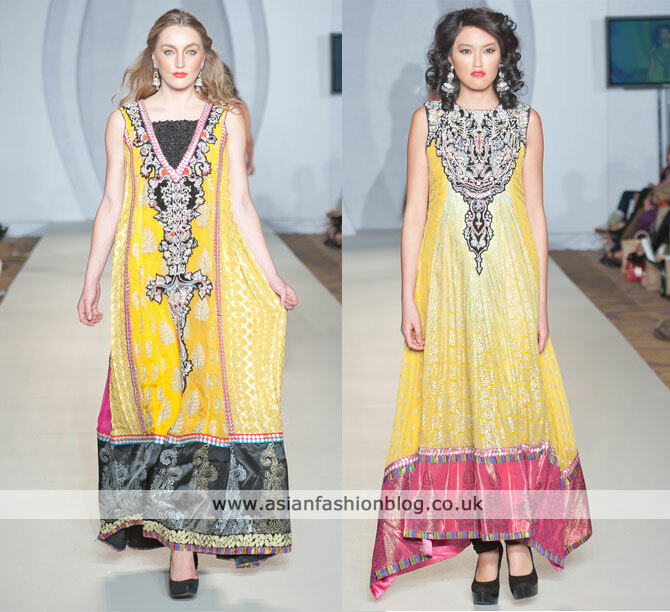 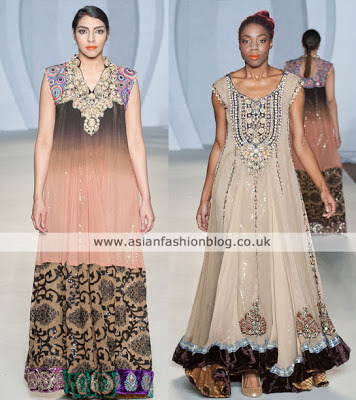 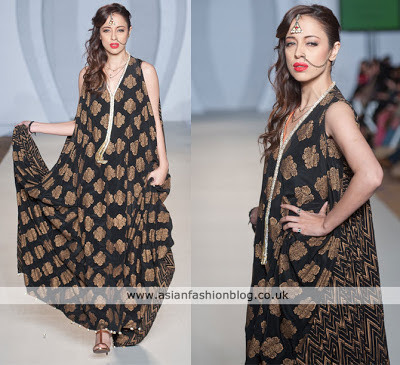 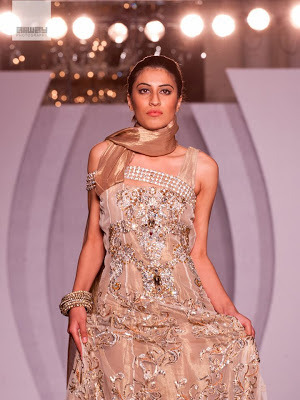 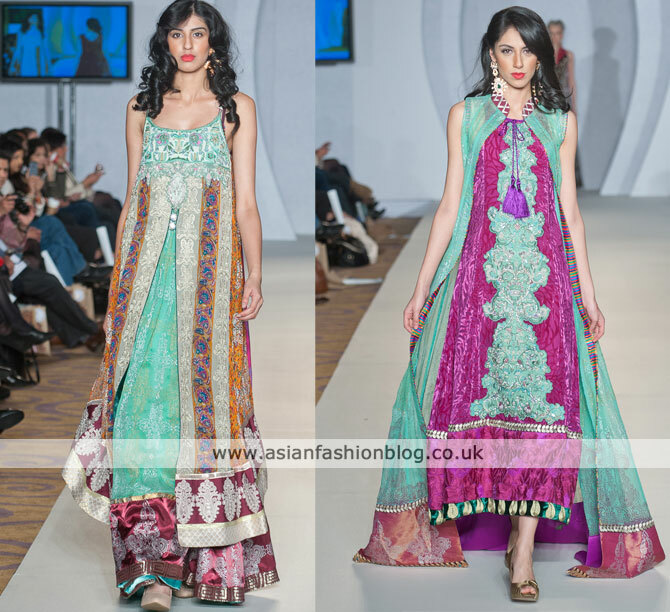 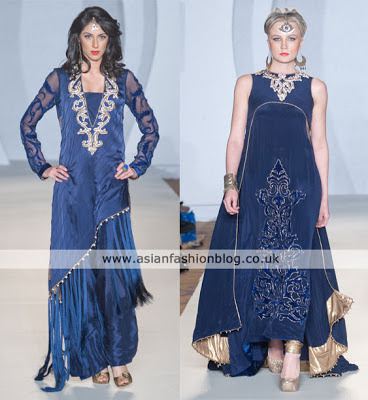 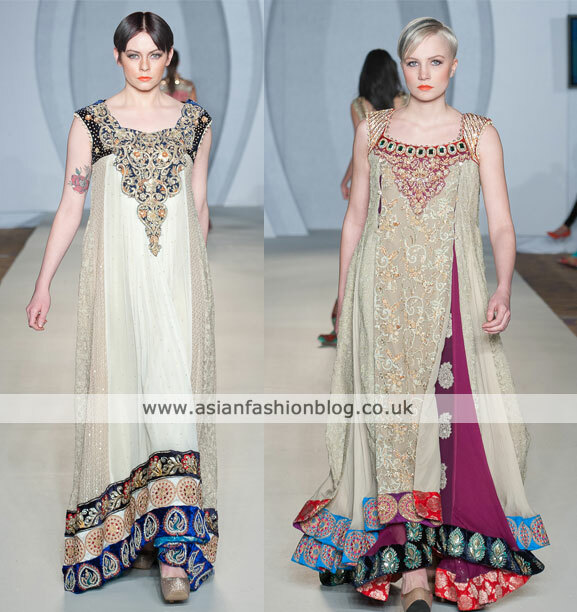 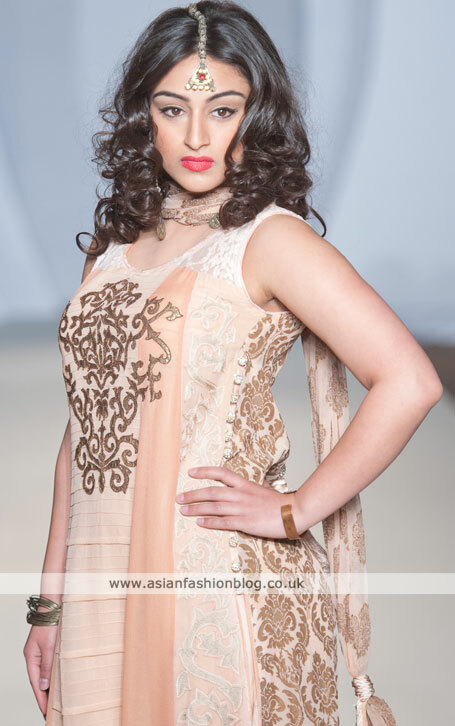 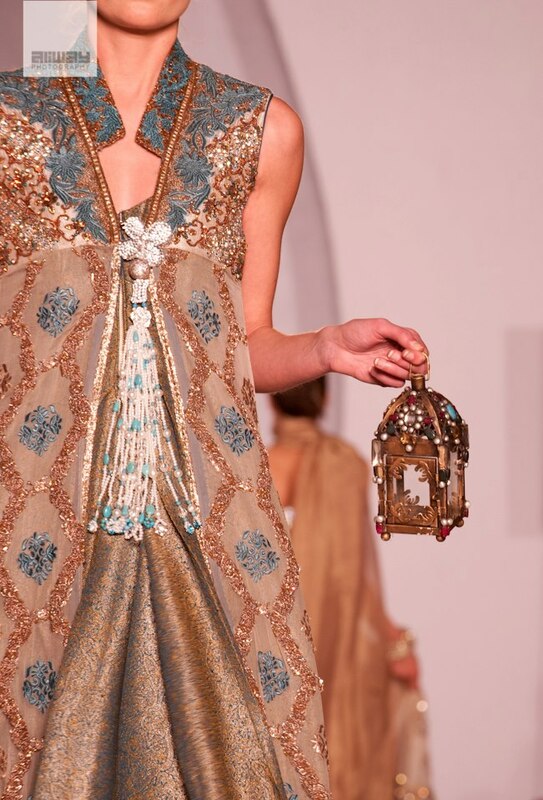 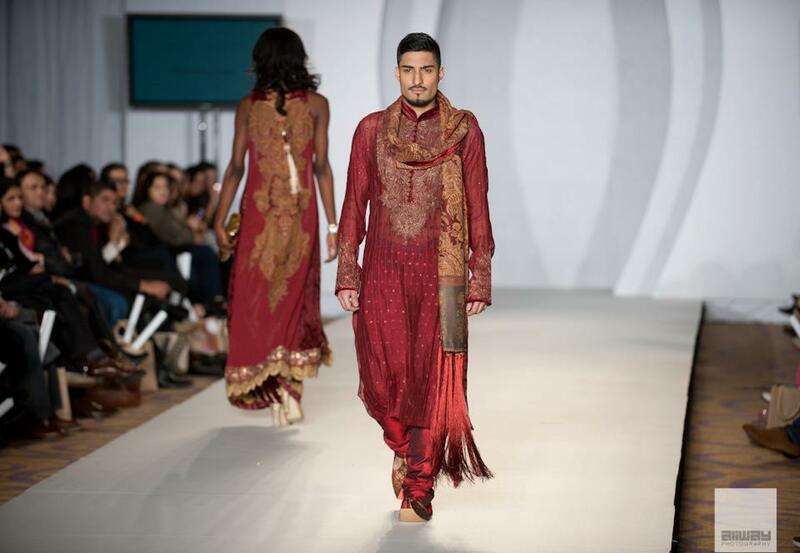 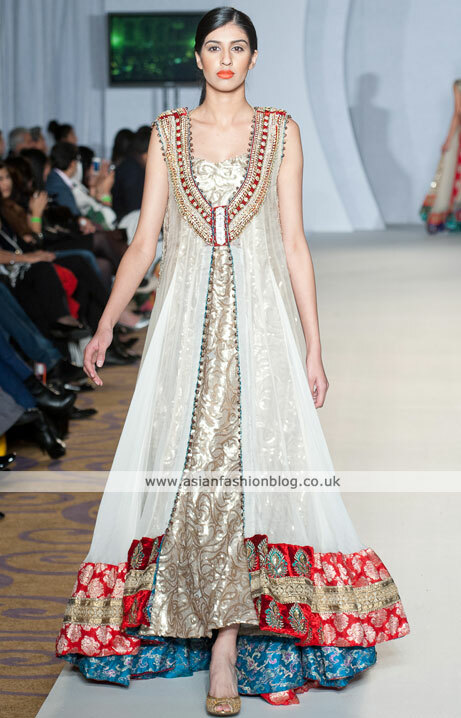 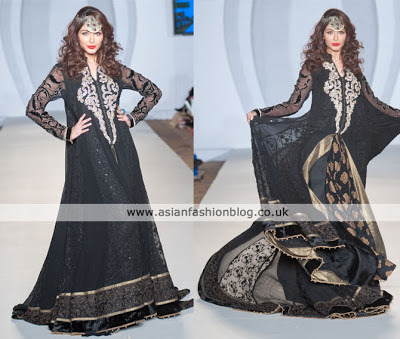 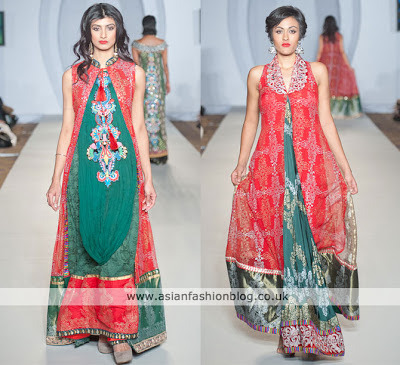 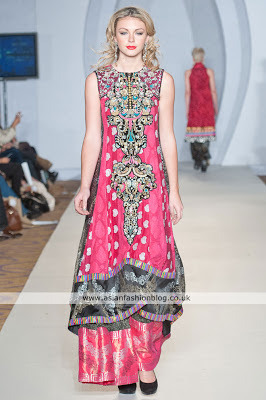 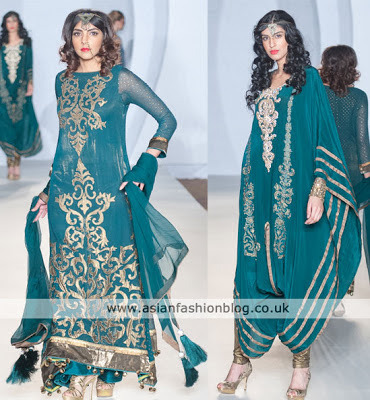 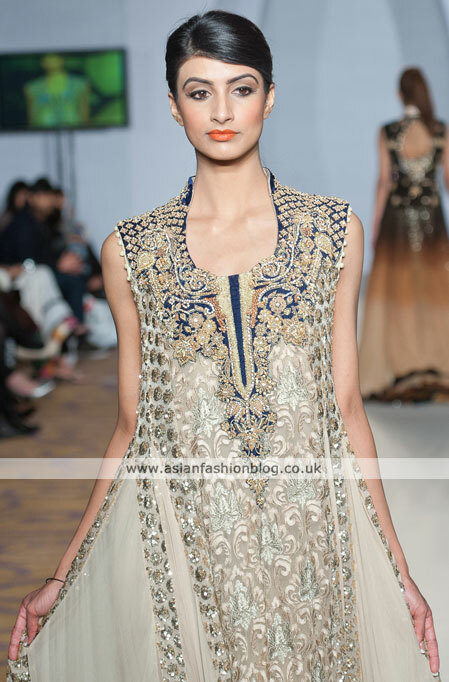 Last weekend saw the return of "Pakistan Fashion Week" to London. 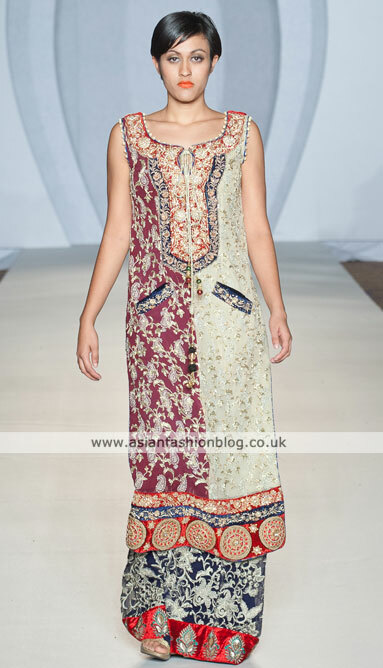 The two-day event saw a range of asian fashion designers showcasing spring/summer collections. I've not had a chance to go through all the collections in detail, but I did come across this great little video montage which was made for implausibleblog.com and featuring photos by Aliway. I'll be posting more photos once I've figured out which outfits were from each designer collection. In the meantime, did any of you attend the shows? 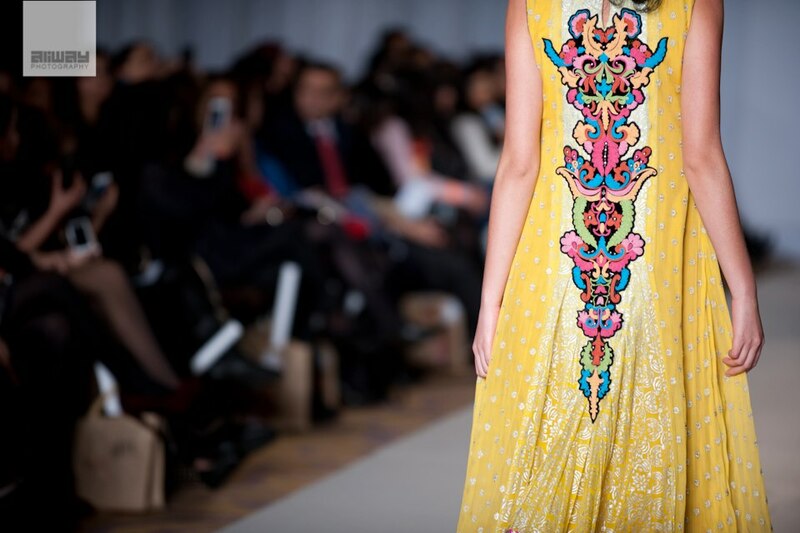 What did you think of the event?